Self-esteem is about the freedom to express yourself without fear. Design Agency Reform Creative has created a visually arresting campaign to promote the Born beauty brand’s feminisation makeup service. Trans identity and gender fluidity are as much human rights issues as they are about self-realisation. “With statistics constantly reinforcing a media concept of trans people as society’s hidden victims, we wanted to present a campaign that was positive and assertive,” Reform’s Paul Heaton explains. 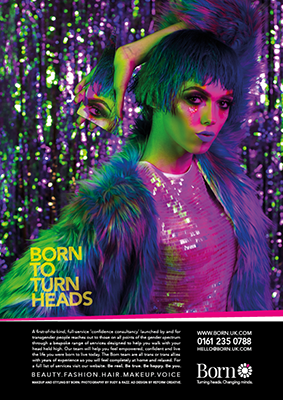 Born is a pioneering full-service consultancy that is run by transgender people for transgender people and anyone on the trans spectrum. It offers a range of services designed to give people the necessary resources to live a confident life inhabiting, and exhibiting, the person they aspire to be. There are no boundaries to this self-expression, hence the bold flamboyance captured in Reform’s striking campaign. Whether it’s the feminisation makeup, voice coaching, or makeup lessons, the Born team will provide suitable professional guidance and support. 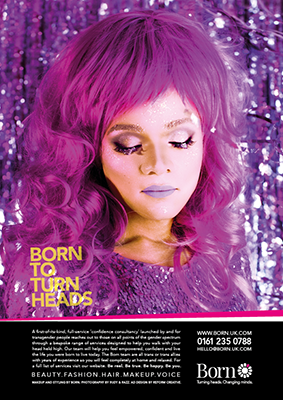 Reform’s advertising campaign for Born aims to help trans people assert themselves by giving them access to the right resources to help build their confidence and self-esteem. Photography by Rudy and Razz.